The English Folk Dance and Song Society is embarking upon the development of a national youth folk music ensemble.With young people at the heart of the programme, the ensemble will be an opportunity to build on the work of existing folk groups from across the country and collaborate with organisations to create a national collective of talented young folk musicians. You can find more information about their plans here. 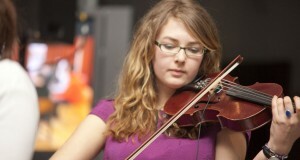 To help with planning and development for the new ensemble, and associated engagement programme, Sound Connections has been supporting EFDSS in their audit of youth folk music provision across England by compiling a survey to gather detailed information on existing models of youth folk activities. Please take part in the online survey to tell EFDSS about any youth folk music activities you run outside of the school curriculum in England. These might include groups, ensembles, bands, courses and projects. The survey is now live and will close on 20 March 2015. A report summarising findings from the survey will be freely available from the EFDSS website in May 2015.